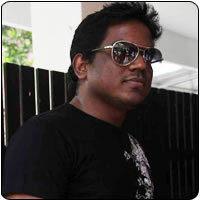 Yuvan Shankar Raja, who takes credits for several hit songs, has an unfulfilled wish. He confessed that he has always wanted to score music for a Hollywood movie and win praises from all corners of the world. But he is very busy right now with several Tamil films in his kitty and is basking in the glory of the latest hit Evan Di Unna Pethan in Vaanam, which has become a rage among the youth. As for his yearning, we wish it happens soon. One more Tamilian on the International arena is a matter of pride.